Music lovers! I’m writing mere hours from the blockbuster pianist Lang Lang’s return to the concert stage after a year and a half recuperating from an arm injury. At Tanglewood with the Boston Symphony Orchestra — currently facing an intriguing gender pay discrimination suit brought by its principal flutist — Mr. Lang will venture back gingerly, with Mozart rather than something more key-pounding. As you can see, he’s been diligently exercising. In Munich, I reviewed a star-filled but dreary “Parsifal.” (The conductor Kirill Petrenko, though, was on fire in his first go at the opera.) I loved David Allen’s profile of Stefan Herheim, a director who always makes me think, but I found Mr. Herheim’s Glyndebourne Festival production of “Pelléas et Mélisande” — set, in classic Herheim style, at the Glyndebourne Festival — uncharacteristically wan. Coming up next week for me is a trip to Santa Fe to revisit John Adams and Peter Sellars’s “Doctor Atomic.” Be sure to read Michael Cooper’s story on the tweaks Mr. Sellars is making to the opera as it arrives at the birthplace of the bomb. Check out a new recording of the opera, with Mr. Adams conducting; I’m feeling the tension of the score more than ever. I hope you got your fill of “The Stars and Stripes Forever” this holiday. On Monday we published a wonderful piece by Sheryl Kaskowitz about the 100th anniversary of “God Bless America”; Irving Berlin’s story of immigrating to the United States strikes a special chord this year. And we included Kate Smith’s first go at what became her trademark number. 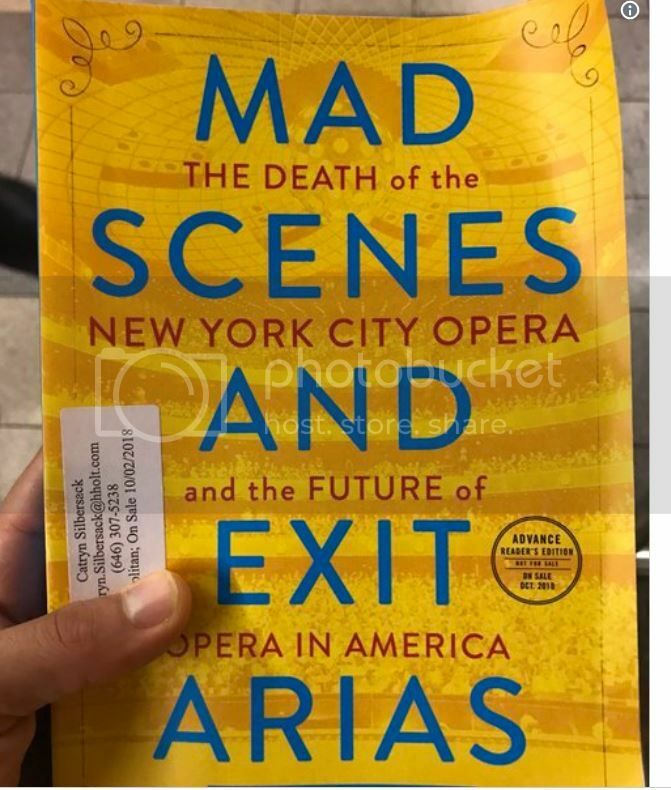 I ate up my galley copy of Wall Street Journal critic Heidi Waleson’s forthcoming book about New York City Opera and did a little tweetstorm about it. We won’t be at the always stimulating Aix-en-Provence Festival this year, but I was pleased to interview Bernard Foccroulle, who is stepping down after an 11-year tenure as director, about his favorite productions there. Last summer, I wrote about Marc Blitzstein’s “The Cradle Will Rock” returning, at Opera Saratoga, in a year in which its themes of inequality, corruption and labor rights were again front-page news. Little seems to have changed — the Supreme Court made another ruling about labor unions just last week — and, as if ready with a response, “The Cradle” is back: A recording of Saratoga’s production is out today, on Bridge Records. And for anyone who thinks they know this show, it’s essential listening. An unbelievably ridiculous potpourri which I am surprised that the Times deigned to print. I don't care what literal anniversary the horrible song God Bless America "enjoyed," it is surely Irving Berlin's worst song that is commonly known and was only introduced to the public by Kate Smith certainly not yet a century ago. Bernstein's Mass is beyond salvation, and I say that as someone who once owned the original recording and watched the revival at the Kennedy Center. In the following much better Berlin music, Donald O'Connor said that in the studio dubbing session he had to cover his ears because Ethel Mernan's voice was so loud, he could not hear himself. Yes, "God Bless America" was composed a century ago, during World War I. According to the Wikipedia article, he revised it in 1938 as a "peace song" and it was then that Kate Smith sang it on the radio. Berlin gave the royalties from probably his best-selling song to the Boy Scouts and Girl Scouts. You can't get more all-American than that. I don't care what literal anniversary the horrible song God Bless America "enjoyed," it is surely Irving Berlin's worst song that is commonly known and was only introduced to the public by Kate Smith certainly not yet a century ago.